Popcorn was, quite simply, the friendliest chicken at FIDDLESTICKS FARM. She insisted on saying hello to every animal every morning. Popcorn was friendly and entertained all the farmyard animals, brightening their days with story. Life in the farmyard was richer for her sunny nature and helpfulness. But then she discovers a strange object in the corner of the barn: the Fabulous Friend Machine. Gradually all of Popcorn’s time and energy is sucked into communing with the friends she has found inside the object. She has so many friends that she hardly notices that the friends around her are missing her. Illustrations use a limited but rich palette of reds greens and blacks. ‘The Fabulous Friend Machine’ is a cautionary tale about the dangers of contemporary communication channels. Virtual ‘friends’ may not always be who they seem. Real friends are sidelined by the Fabulous Friend Machine until it seems that disaster must ensue. Recommended for early primary readers and teachers/family wanting to open conversations about cyber-safety with young users of technology. 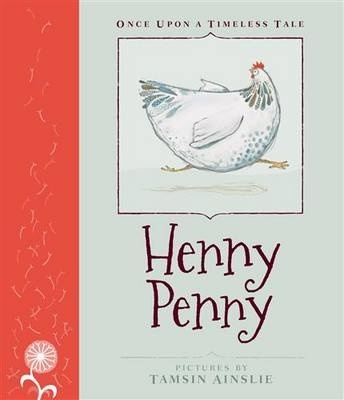 Once, when Henny Penny was pecking at her early-morning corn, something fell on her head. So she ran one way and peered. Then she ran another way and peeked. She looked here and looked there, but she saw nothing and no one. Henny Penny is concerned that bits of the sky are dropping and one by one her friends join her flight from the falling sky. They are even joined by Foxy Loxy who appears to be worried about the sky too. He leads them to tell the king. But when they reach the ‘palace’ it’s not quite as they imagine and a new flight begins. Text is set on one side of each opening, illustration on the other. Illustrations are stylised and set in white paper with the landscape framing the action. Henny Pennyis a story that has been told many times over the years. This retelling from Little Hare is part of a series of popular traditional tales revisited. Each is illustrated by an Australian illustrator. The text is accessible to an independent reader and the illustrations are just beautiful. Recommended for pre- and early-schoolers and anyone fond of traditional tales. ‘Chicken Big’ is a delightful piece of nonsense. Chicken Big hatches from the largest egg anyone in the henhouse has ever seen. It’s so big that they’re sure Chicken Big cannot possibly be a chicken. Chicken Little is sure Chicken Big must be an elephant. So poor young Chicken Big is banished from the hen house. But Chicken Little also thinks that the sky is falling, the sky is leaking and other calamities are imminent, so perhaps he’s not an authority on anything. But the other chickens listen. Each time, it’s Chicken Big who saves them from terrible fate. Eventually they decide that he must be a chicken after all and readmit him to the henhouse. Now everything will get back to normal…won’t it? Chicken Big is a delightful piece of nonsense. Chicken Little is there, and scaremongering as per the falling sky, but he/she’s not alone. The other ‘normal’ sized chickens/hens are quite foolish and easily led, with only Chicken Big showing a modicum of sense. And he’s the youngest! There is plenty to giggle about, but it’s also a good way to introduce the notion of difference and belonging and sense and nonsense. There are lots of speech bubbles to add to the hilarity. The illustrations are full of colour and life, with all the chickens having very expressive faces. Recommended for pre and early primary children. Whacko the Chook is feeling sad, and decides she needs a friend – so she sets out to find one. But the other chooks are busy with their own lives, and don’t seem to need Whacko. Each rejection makes her sadder and sadder, until finally she gives in to the urge to go and hide in a nice dark place. But in the nesting box she discovers that her urge for a friend is also a deeper urge to lay an egg. With her new egg, Rodney, Whacko realises she has a friend all of her own. Whacko the Chook is a humorous picture book story with a gentle message. Kids will love the different chicken characters – as well as Whacko, a plain white chicken with a scraggly red head, there is Henny-wise, a helmet wearing hunter, Chooky Looky, a crazy spotted hen who is convinced the sky is falling, and Pretty-Little Pennyfeather, a vain, conceited hen. Adult readers will enjoy creating voices for the four characters, with plenty of dialogue with which to have fun. The illustrations, too, will delight, with the browns and greys of the chook pen brightened with the reds of the hens’ heads and other splashes of colour. The hens’ facial expressions are hilarious. This a fun offering which will appeal to the obvious preschool audience, but also to older children. A Nest for Korais a picture story book about a safe place to fall. Its subtle message shows that from firm foundations, namely Kora’s Granny, Kora is able to explore and experience things without fear. Kora, like any youngster, is out to amaze the world with her first egg. Granny is keen to share her own experience with Kora who is determined that her first egg-laying is going to be very different. Kora searches the farmyard looking for the perfect place for her nest, refusing to listen to Granny’s advice. It’s not until she is sitting in her perfect nest does she realise that sometimes perfect is not perfect at all. Back in the hen house surrounded by family and friends Kora lays her first egg and everyone agrees that it is a very fine egg indeed. A Nest for Kora is a simple while important story about the importance of family, told with the help of Judith Rossell’s E. H. Shepard – like (of Winnie the Pooh fame) illustrations. This review first appeared in Pass it On Newsletter. It is reprinted here with permission. Life is great on Peachberry Farm until a greedy fox starts paying regular visits. He keeps stealing Harriet’s eggs. Harriet knows he is scary, but she is also determined to stop his raids. None of the other animals want to help – they are too scared. So it is up to Harriet. When the fox makes his next visit, Harriet is ready for him with some special eggs which she has prepared just for him – with a dash of chilli. The unsuspecting fox gets more than he bargained for when he gobbles up the special eggs. Harriet watches in glee as he flees the farm, never to be seen again. Harriet and the Fox is a bright and humorous picture book offering from author Rina A. Foti and illustrator Judith Rossell. The text is simple and youngsters will love seeing the mean old fox outwitted by the clever hen. They will also adore the illustrations with big, bold animals and loads of colour.